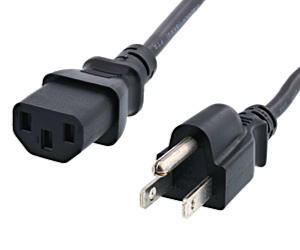 The cord that connects your computer to the AC power source has the distinction of being just about the only thing on your computer that has remained relatively unchanged since the early days of the PC. A power cable from a 20-year-old computer will probably fit the one you're building today just fine. The power cable actually has an official name, by the way. It's officially called a NEMA 5-15P to IEC-320-C13 cable. So go have some fun. Go to a computer shop and tell them you want to order a NEMA 5-15P to IEC-320-C13 cable. Just don't blame me if they slap you or think you're a nerd. 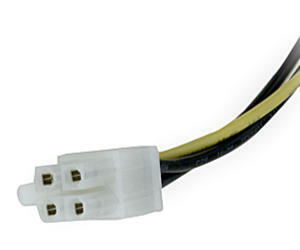 SATA drives use a power connector that's specially designed to enable "hot-swapping" the drives, something that would have been rather difficult using the older Molex connectors. That was kind of by design because older PATA drives were not supposed to be hot-swapped. In addition to the standard SATA power connector shown here, there are also "slimline" and "micro" SATA power connectors for use in some tablets and other small form-factor devices. 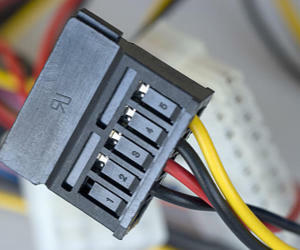 In addition to powering SATA drives, SATA power connectors have become the de facto standard for powering everything else that use to be powered by Molex connectors. 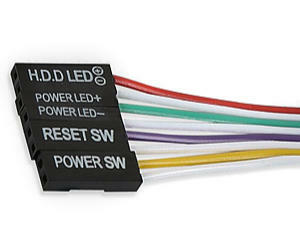 Because it's become the new standard, practically all new power supplies come with a wealth of SATA connectors, but few or no Molex connectors. If for some reason you need to power a device that wants Molex from a SATA plug, you can purchase a SATA-to-Molex adapter that will make that happen. The voltages are the same. The main power connection to the motherboard is provided by something called the P1 connector, appropriately enough. It can have either 20 or 24 pins. Many have a 20-pin connector attached to a removable 4-pin connector. The P1 connector is keyed to help prevent incorrect insertion and is held tight on the motherboard by a little plastic clip. If it doesn't fit, don't force it. You're probably trying to attach it backwards. If by sheer brawn you managed to make it fit backward, you would immediately fry every part of your computer the moment you turned it on. So don't do that. Never plug an ATX power supply into AC power unless the P1 connector is connected either to a motherboard, a test load, or a power supply tester. Plugging an ATX power supply into AC power while the P1 connector is not connected to a load will destroy the power supply. This is a 6- or 8-pin power connector that feeds higher-end GPU's, whose power requirements are much too high to be fed through the motherboard slot. Some video cards can eat up 125 Watts of power or more just by themselves. 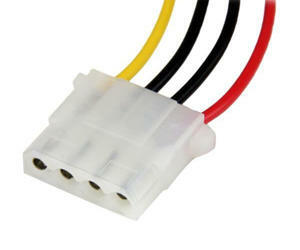 As with the ATX power connector, these connectors very often can be used for either 6-pin or 8-pin power inputs by making two of the leads detachable from the other six. Dome motherboards with integrated video also require one of these to be connected to the motherboard, usually near the GPU. They connectors are keyed to prevent incorrect attachment, but being made of plastic, it's possible to connect them backwards if you pushed hard enough. So don't try to force them. If the power cable won't attach to the input with just a little force, you probably have the plug reversed. This connector got its start with the Intel Pentium 4 processor, which required an additional connector that wound up being called the P4 connector. It was attached to a socket on the motherboard that usually was located very near the CPU. Some AMD Athlon processors also required the P4 lead. Many motherboards designed for newer Intel and AMD processors also require the P4 lead. As a general rule, if the motherboard has a socket for a P4 connection, it should be connected. If you're in doubt, consult your motherboard's manual. For a while, some other devices (especially high-powered video cards) also used a P4 connector to supply extra juice beyond what they could get from the expansion slots. Newer devices tend to use either a SATA power connector (because power supplies tend to come with an abundance of them), or the 6- or 8-pin GPU connector described earlier in this page. Like any other unused adapters, if your power supply has one or more P4 leads that you don't need, tie them off out of the way of fans, other components, and metal parts. PATA hard drives, most other IDE and EIDE devices, and occasionally some older expansion cards that needed extra power beyond what the expansion slot provided, used a standardized, 4-conductor power connector like the one shown here. 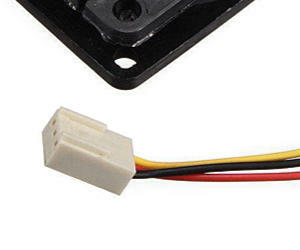 It's called a Molex or P5 connector (the "P" referring to "power"). 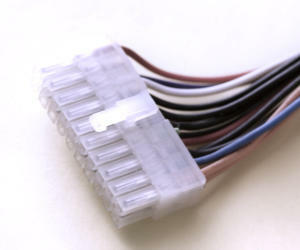 Molex connectors are rapidly becoming little more than a memory as SATA eclipses PATA as the standard for internal drives. But this is an educational site, so consider this a history lesson. 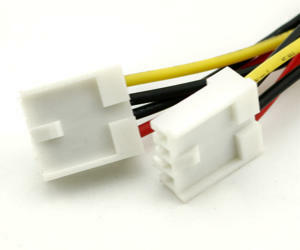 Molex connectors are shaped in such a way as to prevent accidentally attaching it backwards, so don't force it. If you manage to apply voltage to a component with the power connector reversed, you will immediately permanently destroy the device. All motherboards have connectors for the leads for the CPU fan and at least one case fan. These provide both power and, in most cases, RPM monitoring and speed control based on temperature. The header for the CPU fan is usually labeled CPU FAN, appropriately enough. The header for the chassis fan may be labeled CHASSIS, SYS FAN, or CASE FAN Most modern motherboards also have a header for the chipset cooler. Some people "hot wire" their fans to keep them running at full RPM all the time. Unless you like making noise, burning out fans, or wasting power, I don't think that's a good idea. Fan speed regulation is one of those things that computers tend to do very well. If you want to tweak your fan speeds, there's probably a setting in the CMOS setup for that. 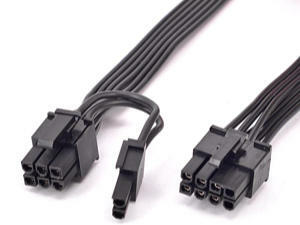 Every computer case comes with a set of wires usually called "front panel leads" that connects the motherboard to the LED's and switches on the front panel. The connectors usually include those for the power and reset switches, the power LED and hard drive activity LED's, and on some cases, the system speaker. If the case has front-mounted USB ports or a card reader, there will be leads for those accessories, as well. The front-panel leads connect to a bus on the motherboard marked with tiny text and polarity markings, when needed, because the headers are not keyed in any way. That means it is possible to attach the leads in the wrong polarity. That's why all the connectors for which polarity matters (mainly the LED's) are marked with a tiny "+" sign or arrow to identify the positive wire. Unfortunately, there's no standardization regarding the exact location of the panel headers. They're usually located on the edge of the motherboard that will be closest to the front of the computer when the motherboard is installed. But there are exceptions. Floppy drives, older optical drives, and some other IDE and EIDE devices connected using an even smaller power connector called a P7, which is shown in this picture. You're unlikely to need this one nowadays. Although P7 connectors were keyed, they were also flimsy; so it was very easy to force them on the wrong way. Even a skinny-armed geek could do it. Consequently, many brand-new drives were immediately burned to a crisp the first time the computers in which they were installed were powered up. If perchance you find yourself having to install something with a P7 connector, and it doesn't slip on easily, you probably have it on backwards. Don't force it. You'll break it, and then you'll burn out whatever device you're hooking up. Use brains, not brawn.